In case the movie release hasn’t already initiated you, Into the Woods (“ITW“) is sort of a big deal. Actually it’s been a big deal for quite a while now, except that –before the movie came out –it was primarily known in theatre circles. 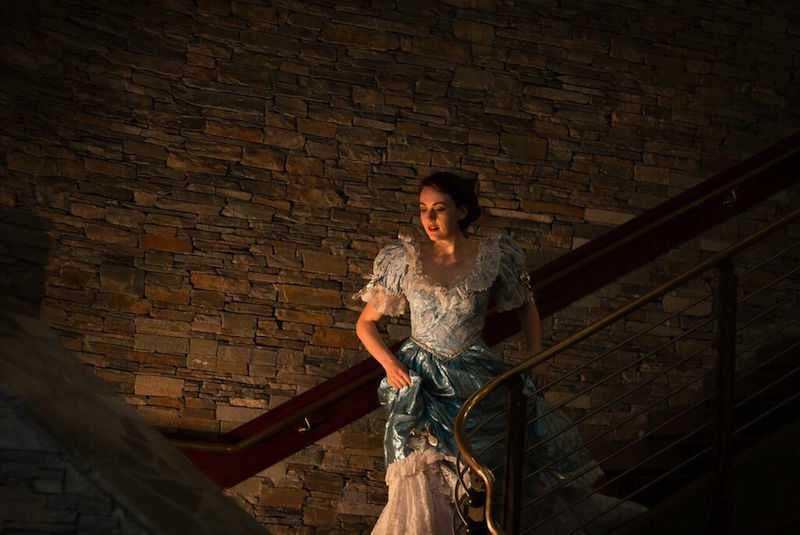 ITW was not the first –nor the last –time someone took a collection of well known stories and turned them on their heads, but it has definitely been the most successful, despite some gory onstage moments. 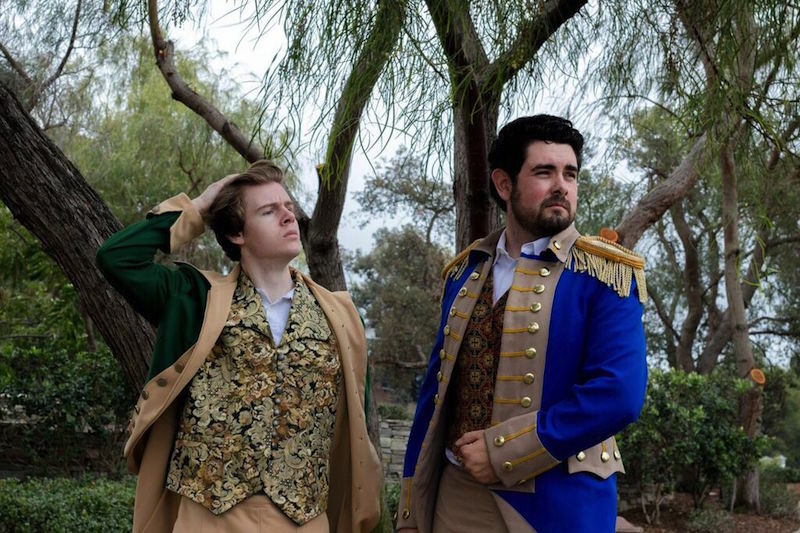 On The Edge Theatre Productions’ Into the Woods doesn’t shy away from the original gruesome nature of the show but instead purposely glosses over it, presenting a more sanitized, humor and solo focused production. “ These are classic stories that people have grown up knowing, they are clear cut and “black and white”. He went on further to state that this story of classic tales is written to be what “life is really like”. So to reiterate– ITW is a dark mishmash of well known fairy tales told in a more realistic way. This kind of story telling is extremely common now, and probably could be considered overdone enough to have just died by now–yet it continues to persist: ABC’s Once Upon A Time (television), WICKED (musical), Maleficent (film) are a few well known examples. There are quite a few storylines, but all of them pretty much connect with the two main characters, the Baker and the Baker’s Wife. They want to have children, but can’t because the Baker’s father angered a Witch in the past, which resulted in the Witch cursing his wife to be barren. The only way to reverse the curse is to find an assortment of specific items that connect them to the other characters and storylines. The second part in understanding ITW is to fully realize that Sondhiem is the composer and Co-Creator of Into the Woods. Musically Sondhiem is very difficult to master, especially vocally. So while there are various moments and songs in On The Edge’s production that possess sufficient emotion –or what I would call substance –they don’t last long. The music is almost always to the point and set to the pace of a well timed marching band with numerous changes in tempo. To put it simply, there’s nothing smooth about the music of Into the Woods. According to Music Director Jared Pugh the music is “atonal,” which is not something everyone necessarily enjoys. This production rely’s more on the talent of their singers than the movement of their players or artistry of their set. Using the curtain, the space in the front of the stage and even offstage, the cast manage to pull of some pretty cool effects. The one that sticks out the most is the climbing of Rapunzel’s hair. The visual of the witch climbing Rapunzel’s long tresses and, at the same time, the pain and anguish someone must feel after having someone climb a wall with their hair. Megan Demarchi’s (Rapunzel) performance here was brutal and made me look away at least twice. The singers here are really good. The director knows this, and blocking is almost entirely guided by the soloist of the moment. Think of a musical revue (a light theatrical entertainment consisting of a series of short sketches and songs) with a little more effort taking place in the background. The cast worked really hard on this show, and the voices are solid. There are some stand out performers here, and if you are a fan of the music, it’s so worth coming to hear 18-year-old Anthony Kairouz sing “Giants in the Sky.” It was the highlight of the night for me. While Kairouz gives a pretty solid performance, Marc Montminy (The Baker) has one of the strongest voices in the show. Montiminy doesn’t sing much, but when he does it’s fantastic. Instead of using a prop cow as Milky White, the lovable bovine that ties everything together is played by Kaleigh Krieger. Krieger’s expressions during the show really make you feel for her. She’s silly, and you can see she’s having a blast playing the part. “Agony,” typically my favorite song, doesn’t fall short in the comedy department. But I was hoping for a little bit more bravado. Christopher Diem (Rapunzel’s Prince) displays this, but Cinderella’s prince (Chris Hunter) needs more gusto. It’s a song about beating the other guy out, and I just didn’t see enough of that. The background track is one of the biggest issue with this production. I’m sitting there listening to some really good voices, and there were moments I wanted to cut the background music because the track was adding nothing. If anything it was distracting from the singing. Some musicals can get away with a background track, but ITW may not be one of them. At least maybe a professional mixer on the boards can balance things out a little. There are some solid moments. If you love vocals and the traditional feel of ITW, this is your ticket. Did you like this review? Love it, hate it. We would love to know in the comments.